Belgian Malinois Temperament - Is This Breed Right For Your Family? You are here: Home / Breeds / Pure / Belgian Malinois Temperament – Is This Breed Right For Your Family? Belgian Malinois Temperament – Is This Breed Right For Your Family? Welcome to our article on Belgian Malinois temperament! The Belgian Malinois dates back to the 1800s. It originated in the area around the city of Malines, Belgium. The Belgian Malinois has been selectively bred for its working character. This breed is perhaps the most popular of all Belgian sheepdogs in its native country. While the Belgian Malinois was originally bred as a sheep-herding dog, their intelligence, trainability, and tenacity have led this breed to serve as police and military dogs. They are also active and competitive in conformation, obedience, herding, sledding, agility, therapy, and tracking. Well-trained Belgian Malinois dogs are usually active, intelligent, friendly, protective, alert, and hardworking. Poorly trained dogs can be destructive or develop neurotic behaviors if not provided with enough stimulation and exercise. You can read our training guides here. They are also great working dogs for the police and guarding. This type of work is their main occupation. Furthermore, they can make them great pets if trained them right. They are watchful, alert, and loyal. Instinctive herding behavior is, according to this study, passed down through dogs genetics. This is not a behavior you want your Belgian Malinois showing. You will have to teach them that this type of behavior is unacceptable. If needed, talk with a professional or experienced owner of this breed before you buy a Belgian Malinois. Are Belgian Malinois Easy To Train? Though the Belgian Malinois temperament is sometimes willful and playful, they are highly trainable and thrive on obedience, trick, and agility training. They can read the smallest of movements and even detect changes in facial expression. This breed is highly intelligent! However, this does not make them ideal for first-time dog owners. Positive reinforcement training is the best way to train a Belgian Malinois, as discipline can lead to bad behavior and stubbornness. Malinois need a lot of high-intensity training and require strenuous activity to remain happy and healthy. This makes them an unwise choice for apartment owners, as they do not like to stay indoors or do well in small spaces. They crave to be a part of family activities, whether it be doing chores outside, playing fetch in the back yard, or taking long walks in the park. Malinois are lovers of the outdoors, family, and fun activities. The Belgian Malinois can typically be aloof and outgoing, but should never be fearful, shy, or aggressive. They make a great watchdog and have the ability to be protective when necessary. When the Belgian Malinois is raised with children, they can be very accepting. Do not forget that this dog was bred for herding and may begin chasing and nipping the heels of people. This is not acceptable behavior and should never be tolerated. Malinois are best suited with a family that has older children that understand how to treat a dog properly. Since the beginning of the Malinois, they were bred to be herding dogs and were able to defend their master and their master’s home. The Belgian Malinois temperament still possesses these traits today. They should not and usually do not respond with aggression or nervousness when introduced or confronted with an unfamiliar person. Instead, this trait is usually a sign that they have not been properly socialized. However, they can still snap or growl out of fear or aggression. For these reasons, it is highly recommended to adopt a Belgian Malinois from a reputable breeder, who produces dogs with a good temperament. Furthermore, you can fix a bad temperament with socialization training. While it is recommended to socialize them at a young age, this can still be done at any age. However, the longer you wait, the harder the training becomes. You can socialize them by taking them to one on one play dates. This can be done a few times a week until they become comfortable with another dog. Keep them on a leash the first time you bring them to interact with another dog. This will ensure that everyone is safe, and you have full control of your dog. You can also take them to a puppy kindergarten class. These are classes where people bring their dogs to socialize with other dogs under their supervision. You can begin looking for a class by going to a local vet and asking about what classes they offer. Do Belgian Malinois Like Other Dogs? The Malinois may not get along with non-canine animals. They might chase cats and other small animals. But they can still get along with an indoor cat if raised together. Belgian Malinois can be aggressive towards other dogs or animals that they do not know. They need to be in a yard secured by a fence. This will keep them apart from other animals, and prevent them from running away. The Belgian Malinois were bred to be herders. This instinct can lead them to chase and nip. They also tend to chase bikes, cars, kids, and other animals. Malinois require a high amount of exercise, and if they do not get this exercise, they can become bored and start herding children and nipping at people heels. This herding instinct also makes them protective of their families and home. This can cause them to be wary of unfamiliar people, so it is imperative that they are socialized from an early age to be more welcoming of new people and other dogs. If they aren’t socialized from an early age, then you may notice aggressive tendencies. Chewing, barking, and separation anxiety are a few more things that this breed can develop. However, this is most likely due to lack of exercise and boredom. Adopting a Belgian Malinois will in return give you an active lifestyle. If you do not want to take care of an active dog, then we do not recommend adopting this breed. Are Belgian Malinois Good Family Pets? 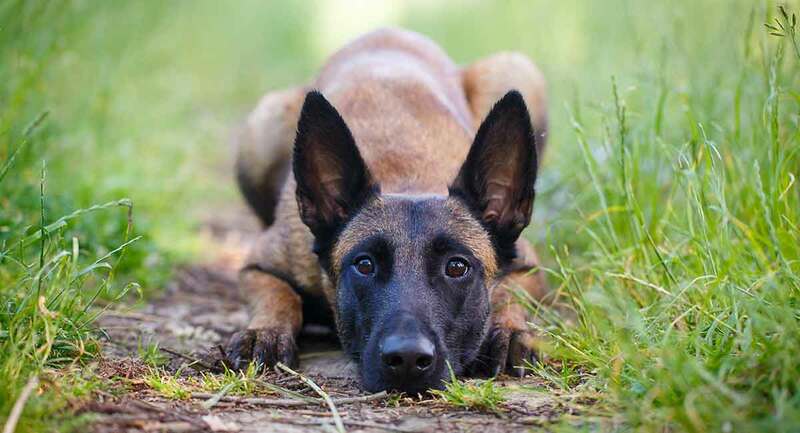 Although the Belgian Malinois temperament is best known for its suitability to herding and working, this breed can make a ‘lovable and devoted‘ pet. However, a thorough and committed training plan is important. If they cannot be involved in sports, they may get bored and not do well in family environments. They also have a few health problems, especially when it comes to their joints and hips. Seksel, Kersti; “Preventing Behavior Problems in Puppies and Kittens.” Veterinary Clinics of North America: Small Animal Practice. 2008. Kutsumi, A.; “Importance of Puppy Training for Future Behavior of the Dog.” Journal of Veterinary Medical Science. 2013. Svartberg, Kenth; “Breed-typical behaviour in dogs—Historical remnants or recent constructs?” Applied Animal Behavior Science, 2006. Arata, Sayaka; “‘Reactivity to Stimuli’ Is a Temperamental Factor Contributing to Canine Aggression.” PLOS Once. 2014. Barbara A. Bockstahler; “Influence of borderline hip dysplasia on joint kinematics of clinically sound Belgian Shepherd dogs.” American Journal of Veterinary Research, 2007.